iPad Malaysia prices slashed after iPad 2 announcement! iPad price in Malaysia slashed. Yup, after the announcement of iPad 2, the price of iPad in Malaysia has been slashed. The price for the basic 16GB WiFi only iPad is RM1199. That’s RM350 discount. All WiFi only iPad models have RM350 discount. 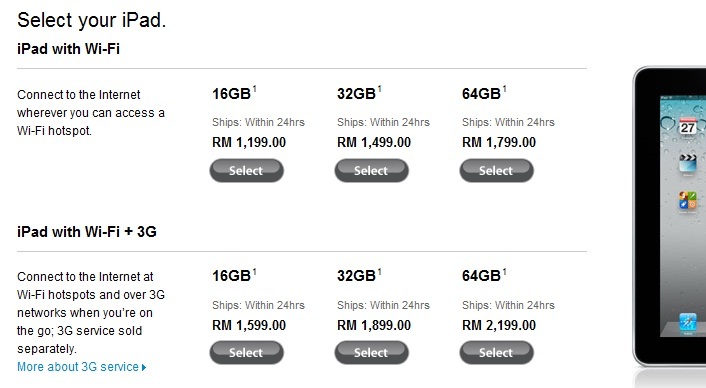 The price of 16GB WiFi + 3G iPad model is even more worthwhile at the price of RM1599. Last time, a basic 16GB WiFi only iPad model costs RM1549. Now, with additional RM50 you can get the 16GB WiFi + 3G iPad model. All WiFi + 3G iPad models have RM400 discount. If you really don’t mind the new features of iPad 2, then you can go ahead and purchase it as it’s cheaper and you can have it right now. Now, the new owners of iPad 2 will have the last laugh or will the owners of iPad 3 have the last laugh? Still, when will iPad 2 launch in Malaysia & Singapore and what will the price of iPad 2 in Malaysia & Singapore? Update: Official Malaysia Price for all iPad Models!!! iPad 2 is FINALLY OUT! When IPad 2 arrive malaysia ? It’s either this Fri, April 22 2011 or next week April 29, 2011 or May 6, 2011. These are speculations only but has some basis. Let’s hope it’s true!!! i think low yatt have it since last weekend la…saw it n touch it..AWESOME! Previous story iPad 2 is FINALLY OUT!